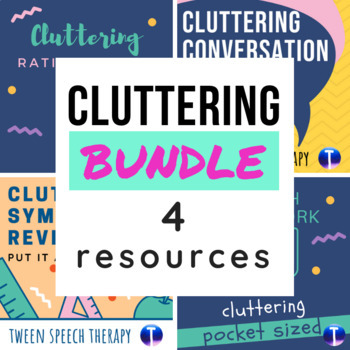 I used to feel like cluttering was one of the hardest speech disorders to diagnose and treat! That's why I spent so much time learning about it and developed these products! This bundle includes rating scales to use as you interview teachers, parents, and even students themselves, plus a form to help you analyze a speech sample. You'll also get a separate form to help you review all of the data, compare it to research-based diagnosis criteria, determine the educational impact, and create a list of the student's strengths and weaknesses. And that's only the assessment forms! You'll also get 24 sheets of cluttering pocket sized homework to use in your treatment sessions, to encourage carryover! For more information about cluttering, read my blog post.